Friday nights use to mean bar nights when I was younger. After a long work week, we’d go out with friends to get a few cocktails and some greasy bar foods. One of my favorite greasy bar foods was jalapeño poppers from a bar a few minutes from our home. They made the best jalapeño poppers I’ve ever had. They were fresh, crunchy and incredibly spicy. Now our bar food usually comes from our own kitchen. This afternoon I made our favorites, jalapeño poppers, but with a healthier spin. Instead of a massive cheese-ball and a little jalapeño, these poppers are stuffed with a mixture of re-fried beans and cheese. Before I deep-fried these, I lightly breaded them with cornmeal instead of the usual thicker flour breading. 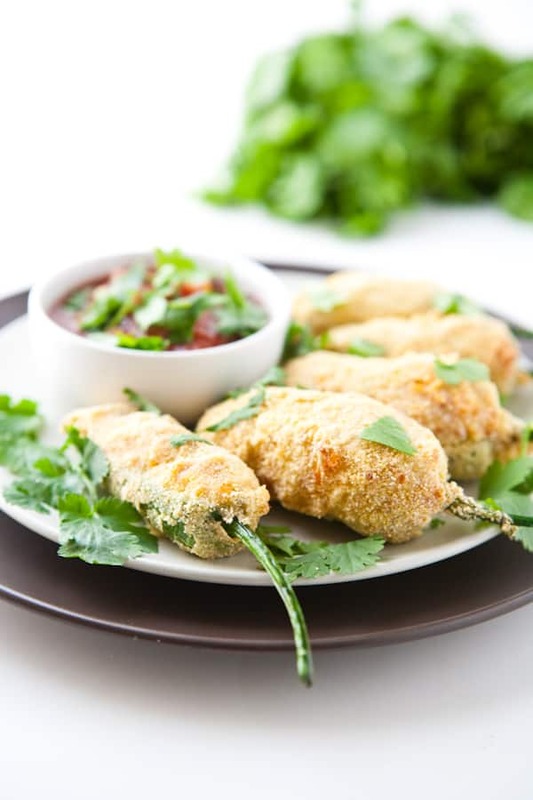 The light crunchy cornmeal combined with the crisp fresh jalapeños makes the perfect popper. Heat vegetable oil for deep frying to 350°. Slice each jalapeno in half legnthwise. Reomve seeds and viens of peppers. Set aside. Combine re-fried beans, cream cheese and shredded cheese in a large bowl. Mix well to combine. Stuff each jalapeño with this mixture. Then dip each stuffed jalapeño in the egg then in the cornmeal. Slowly and carefully drop each breaded jalapeño in the hot oil. Cook for 2 - 3 minutes, or until lightly golden. Place on a rack or paper towels to drain. 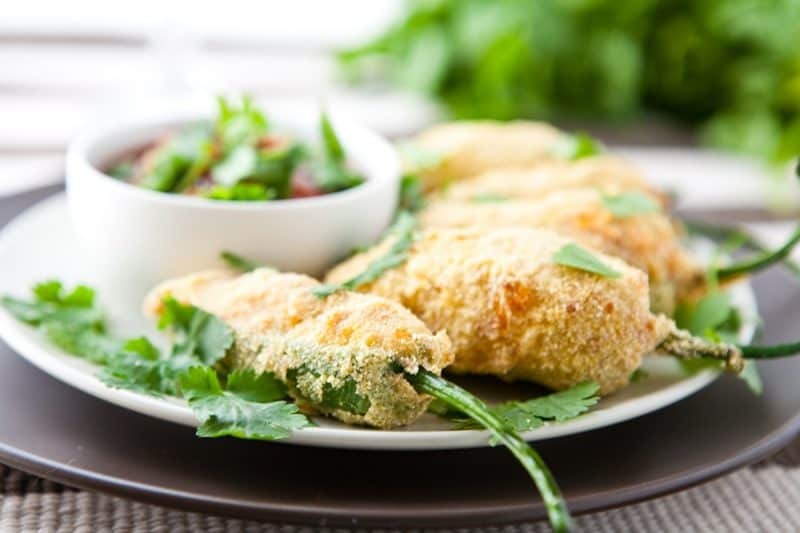 Serve jalapeño poppers with your Old El Paso salsa. I think I might need the whole plate. Heat is on! They’re gorgeous! Hopefully Paula will share with me, because I’d like the whole plate too! YUM! I love jalapeno poppers – I usually have to make a double batch! Love this! My boys would eat these up! I may have to plan a party just for these babies! Is it Friday yet? Dang girl, these are fabulous. 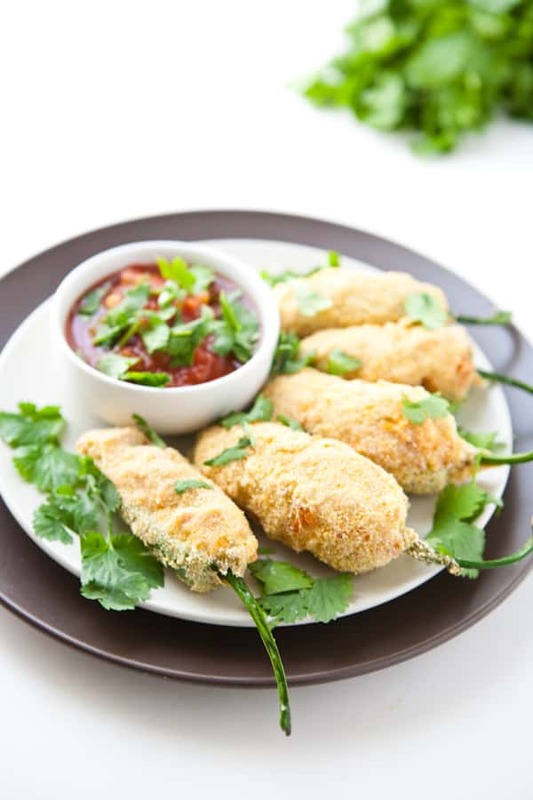 These look delicious, I love jalapeño poppers and can’t wait to give them a try. Ooooo…love these with the beans, fabulous!! !